Hamburg, 30 June 2011 � The new PEN Mini is a tiny powerhouse of a system camera with interchangeable lenses. It�s also a beautiful camera that takes even more beautiful images and it couldn�t be any easier to use. The Mini is ideal for anyone who wants a fuss-free camera that fits in as well as at a party as it fits in their pocket. Just like a point-and-shoot, it comes in six colours but the Mini is really an SLR-quality camera hiding behind the simplicity and looks of a genuine compact. It makes high-class photography and movie-making wonderfully easy. Olympus� Live Guide gives beginners intuitive control of key parameters like aperture and depth of field, without them needing to know how they work. Six Art Filters add fun creative effects to both Full HD movies or stills and if you don�t know what a setting in the menu is for, a window pops up to tell you. 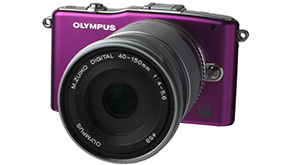 With world�s fastest* autofocus systems, great low light performance plus a superb choice of high-grade Olympus lenses and stylish accessories, it�s tough to see just what the PEN Mini can�t do. Also known as the PEN E-PM1, it�s available from early autumn 2011 with pricing to be confirmed. Olympus developed the PEN for people who get a kick out of great images, but find shooting with high-end cameras way too tough since most SLR cameras are heavy to carry and relatively difficult to use. The Olympus PEN Mini changes all that. The Mini generates the stunning picture quality of a large SLR camera, with none of the hassle or baggage. It�s smaller and lighter than almost every other system camera with interchangeable lenses, has a faster autofocus*, plus it�s easy to use and it looks fantastic. This new PEN has the inimitable style of a must-have icon. With its slender contours and premium finish, it�s the sort of camera you�re happy to take out and show off wherever you are. Even the supplied high-grade lens looks the part. Live Guide, without knowing how they work, you can adjust factors that are essential to final picture quality, including Colour Intensity, Lighting Mood, Brightness, Background Blur and Motion Blur. Of course, the Live Guide helps you capture excellent movies as well as stills. The Mini can record moving footage in the beautiful 1080i Full High Definition AVCHD format, which generates smaller files that are perfectly suited for playing back on TV. Alternatively, you can select 720p HD Motion JPEG video, which makes the files easier to edit on a PC. If you like the visual effects graphic designers add to photographs in magazines, you�ll love the creative Art Filters on the PEN Mini. There�s Pop Art, Soft Focus, Grainy Film, Pinhole, Diorama and Dramatic Tone, which gives shots a dynamic atmosphere by boosting the contrast. All six filters can be applied on-camera to both Full HD movies and stills � at the touch of button, no PC software required. As soon as your photos are ready, you can share them with friends on the LCD as a slideshow � or in radiant colour on a big High Definition TV. As a system camera, the Mini is compatible with a huge range of accessories and lenses for every possible situation. The main kit includes a first-class M.ZUIKO DIGITAL 14-42mm (28-84mm**) 1:3.5-5.6 II R lens, but the Mini can also take more than 500 other lenses (some via an adapter), including Olympus� legendary M.ZUIKO DIGITAL range of ultra-high quality optics. Thanks to the Mini�s in-body Image Stabilisation, irrespective which lens you choose, blur-free shots are virtually guaranteed. The Mini�s FAST AF has a big role to play here too. It�s one the world�s fastest* autofocus systems for cameras with interchangeable lenses. Port 2, for example the Bluetooth�-compatible PENPAL Communication Unit that automatically reformats still photos for wireless transfer to other compatible devices and social media. For safe, stylish and inconspicuous storage, the optional sporty Street Case fits the Mini like a glove. The PEN Mini is available in black, white, silver, dark brown, purple and silver rose from early autumn 2011.